ROAR! is The Ringling’s family storytime designed to engage toddlers and preschoolers in activities that connect art with early literacy. Join us in for a story and an accompanying activity. Join a Museum educator for a one-hour tour designed for parents or caregivers visiting the museum with an infant. This tour allows for adult discussion within a group that does not mind if a chatty or crying baby joins the conversation. These special days are fun for the whole family! Join us for art making, and activity stations. We will also distribute themed family activity booklets to use in the galleries. The Playspace is available for families and school groups to enjoy. A tower and slide, basket swings, hand-powered fountains and other novel pieces of equipment promise to deliver good times and gales of laughter. Follow this self-guided itinerary and enjoy some kid-friendly activities while getting to know a little bit more about John and Mable Ringling and the Museum they built. 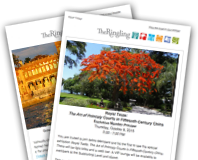 Preview our Family Guides to get ready for your visit to The Ringling! Printed versions are also available to pick up for free on the day of your visit. This initiative provides Family-level memberships at no cost to select families in the community to help remove barriers to museum access.